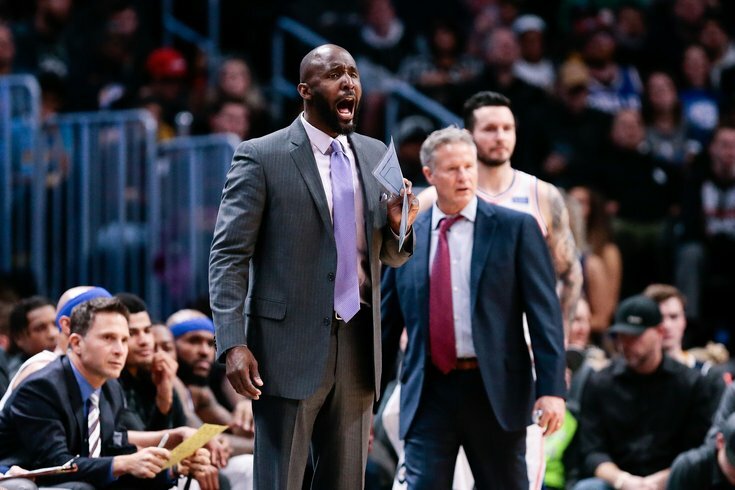 Philadelphia 76ers assistant coach Lloyd Pierce with head coach Brett Brown in the fourth quarter against the Denver Nuggets at the Pepsi Center. The Atlanta Hawks have hired Sixers assistant coach Lloyd Pierce to be their next head coach. If it worked for Simmons and Embiid, it should work for Markelle Fultz, right? Pierce's hiring was reported first by ESPN's Marc Spears and Adrian Wojnarowski, and later confirmed via Atlanta's official Twitter account. “This is a day I’ve been working towards for a long time and it’s an honor to be the head coach of the Atlanta Hawks," Pierce said in a statement. "I have great respect for [Hawks GM Travis Schlenk] and strong belief in his plan to bring a championship to the city of Atlanta." The hiring of Pierce coincides with a shift in how people view the Sixers around the league. As the team has grown in stature with Joel Embiid and Ben Simmons running the show, the profile of everyone around the organization has grown alongside them. Even if Pierce is the same guy he was a couple years ago, when the Sixers were only winning 10 games, he has been given a lot more consideration as a candidate thanks to the improvement of the team. As Atlanta moves into a complete rebuild, Pierce's experience with Philadelphia's process and his strong background in player development have made an impression on Schlenk and ownership. Atlanta has four picks in the top 33 of the June NBA Draft. How this move will impact the Sixers is presently unknown, but Pierce was an essential part of Brown's coaching staff. Sources with the Sixers relayed throughout the season that Pierce's responsibility came primarily on the defensive end of the floor, where he was intimately involved in crafting defensive gameplans based on the opponent. Given Philadelphia's success on that end of the floor, it's no surprise Pierce started to get some attention as a head coach candidate. One area that is hard to quantify but is worth mentioning is Pierce's absence in the LeBron James sweepstakes. If the Sixers are able to lure the all-time great to Philadelphia, the presence of an assistant coach he likes was not going to be the critical component in making it happen. But Pierce previously worked with James as an assistant in Cleveland, and has been spotlighted by James on more than one occasion as a friend and respected voice. James has called him, "one of my favorite coaches," and referred to him as a "great friend" on his own social media channels in the summer of 2014. As for the path to replacing Pierce on staff, that will come from a collaborative process between the head coach and other higher-ups in the organization, PhillyVoice has learned. Brown has relative autonomy when it comes to making more entry-level/developmental staff hires, and retains the most say when it comes to additions to his bench. There is more involvement from other parties — including management and ownership — on a front-facing assistant like Pierce, however. Brown and the front office have discussed the possibility of staffers leaving for a period of over a year, a source told PhillyVoice, and will collaborate on who to bring in to replace Pierce. This process includes whether the position and Pierce's responsibilities can be filled using internal options. A source relayed to PhillyVoice that the Sixers will seek to resolve Brett Brown’s extension, discussed during Bryan Colangelo’s media availability Friday, before moving forward on replacing Pierce.